The Velvet Illusions, the legendary seven-piece 60’s teenage rock band, was formed in Yakima, WA, circa 1965. We utilized Vox amplification and Vox and Mosrite guitars, including a Mosrite double-neck. We practiced seven-days-a-week in order to learn and perfect our versions of popular songs of the day. We also wrote and recorded originals; and we recorded two songs written by the great Jerry Merritt, a former member of Gene Vincent’s Blue Caps. I was co-lead singer and guitarist in the Velvet Illusions. Steve Weed, our Vox Continental organ player, and I sang all the songs, and were joined by a bunch of talented musicians, including George Radford, Jr., who played three sizes of saxophones. We performed throughout the Yakima area, building a local fan base, and we released several 45-RPM records. In early summer, 1967, we relocated to Hollywood, CA in an attempt to get in the game with the big kids. As well-scrubbed, innocent Yakima boys, we were fish out of water! We had no experience to speak of, with alcohol, let alone drugs. We had fun hanging out at “hippie” places, observing but not being a part of, that scene. We played a limited number of gigs, suffered membership changes; but also managed to record four additional songs. (I left the band before those last four tunes were put down on wax — great songs!) We broke up in 1967 and returned to Yakima. Several of us who were still friendly, played one fantastic gig as the Peppermint Tea, playing to a large crowd during the halftime of a Harlem Clowns basketball game; but then we faded out. Subsequently, people all over the planet began collecting Velvet Illusions 45’s. Various companies placed our songs on compilation cd’s. I was unaware of this phenomenon, until I finally learned about it in 1987. I began to work diligently to get our story told accurately, and to get our music officially released. It took years to do this. 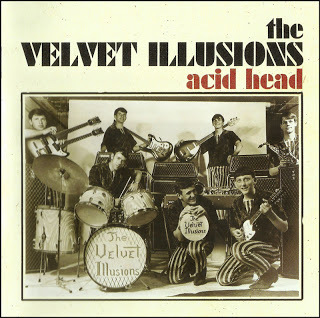 In 2011 we released our cd, The Velvet Illusions “Acid Head”, on Tune In Records. This project was spearheaded and accomplished by Londoner, Gray Newell. The cd received wonderful reviews, and sells well on several websites. Many Velvet Illusions videos can be found on YouTube. Folks have incorporated various tracks from the cd, to combine them with photos/video/animation. I’ve seen three skateboarding videos, a psy-fi video and cartoons, as well as covers by various modern bands. Combined, the videos have had 30,000+ views. The above-mentioned Gray Newell also wrote a 6-page history of the Velvet Illusions which was published in the great collector ‘zine, “Ugly Things”, in 2012. We are not through: We hope to release a limited-edition LP, complete with new cover art. And we are also hoping to have a full-length interview published by another collector ‘zine, to be written by a leading authority on psych bands of the 60’s. I’ll have more information about these projects. But stay tuned. The Velvet Illusions story is ongoing!